My husband and I went to my favorite Indian restaurant this weekend which was yummy! This is what I wore out to lunch. It consists of the J.Crew Postage Stamp Mini in Big Apple, J.Crew popover shirt and Target Merona Sweater. My shoes are J.Crew Lilibeth Patent Sandals and the bag is the Prada Saffiano Lux tote BN1844. You might also notice the big orange car I am standing next to. The Dodge Challenger R/T Classic is my husband's "baby" and "weekend" car. It is big and orange as you can probably see. 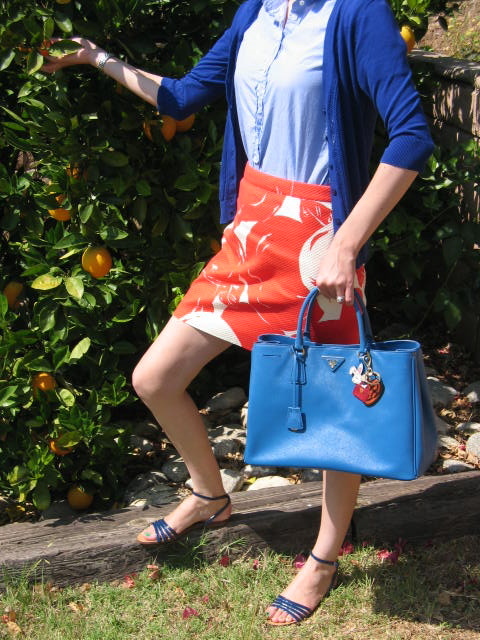 I liked the fact that it sort of matched my skirt, so I told him to take a picture of me next to it! One thing you might notice about my bag is the bunny charm. I love bunnies and one year ago this week my beloved Sophie passed away. Sophie was grey and white French Lop. I bought this charm because it reminded me of her and the one Halloween when I dressed her up in a sombrero. The charm features a sombrero like hat, although the sales associate at Prada told me that it was not a sombrero and rather some other type of beach straw hat featured at one point in Prada's spring/summer line of clothing. Well, it looks like a sombrero to me! Here is a close up picture of the charm and of my bunny, Sophie wearing her hat. Love this look! I just started following your blog. Thanks so much for following my blog Cate O! I just started following yours too! It's great! Thanks phiphi! You're so sweet! Sophie was definitely not very "amused" while taking this photo! Bunnies and sombreros don't mix! I appreciate you looking at my blog!